Also 2 years free warranty. The Sony HT-RTS offers 5.1 channels of immersive audio to totally surround your senses. Complete with a three channel sound bar, wireless subwoofer and two wirelessly connected rear speakers, the home cinema system will direct the movie to you. How are the 2 small speakers powered any one know? Individual power plugs or two in one? Yes its 579. Just debating whether its worth the difference. 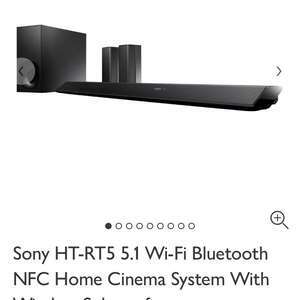 Good price, wish i had the money as i dont like my lg bar with my sony tv …Good price, wish i had the money as i dont like my lg bar with my sony tv “/ How are the 2 small speakers powered any one know? Individual power plugs or two in one? Individual power plugs ! Can’t say much about quality as I am getting mine on wednesday ! Individual power plugs ! Can’t say much about quality as I am getting mine …Individual power plugs ! Can’t say much about quality as I am getting mine on wednesday ! I've had this for 6 months, no sync issues, it's not the best sound in the world compared to more expensive systems, but for the price and wireless rears its a good system for the price. I've had this for 6 months, no sync issues, it's not the best sound in the …I've had this for 6 months, no sync issues, it's not the best sound in the world compared to more expensive systems, but for the price and wireless rears its a good system for the price. Does it make seats rumble during aAction scenes? The sub is good enough, plenty of bass, although my previous Samsung sub used to make my seat rumble. It is what it is for the money. You can adjust the volume of individual speakers. Would I buy it again. Probably not to be honest as I would rather save a bit more for something better. The wireless rears on this do not really affect the sound due to not enough volume, even set at full volume. Have u got the system yet? If so what's quality ? Is it excellent or ok? Is there anything Impressive or downside u want to say about !! I’m undecided between this and the LG SH7. Hmmmm thoughts please?? Well I always used the tv speakers so for me this is just absolutely amazing... very easy to setup. Sound is great.. goes up to 40 but I find that 16 is enough for me. Works very well with my ps4 pro. The rear speakers are a bit quiet so I had to manually set the volume up on these (it’s pretty easy). So if I must be honest, I am very pleased with it. I think that for 299 you can’t go wrong.. you can probably get much better than this but not for this price ! Deal posting newbie! This is zak_natore first deal post. Help out by leaving a posting tip or just to show your appreciation for their contribution.